Leovet®'s Hoof Lab Hoof Hardener is ideal for horses with chipped, brittle hooves, low heels, separating hoof walls, and for barefoot horses. This hoof hardener works to strengthen the hoof wall and sole. This gives shod horses a firm seat for the shoe and unshod horses extra support. This easy to apply product will help protect against hoof decay and make the hoof significantly more durable. Does not contain glutaraldehyde, petroleum jelly, mineral oil, or parabens! Apply to the clean, outer horn wall, and if necessary also to the sole, three times a week until the hoof is hardened, and once a week afterwards. Do not apply to the coronary band, heel, and frog. For shod horses, apply up to the nail holes; for barefoot horses, also apply to the wall and the white line. 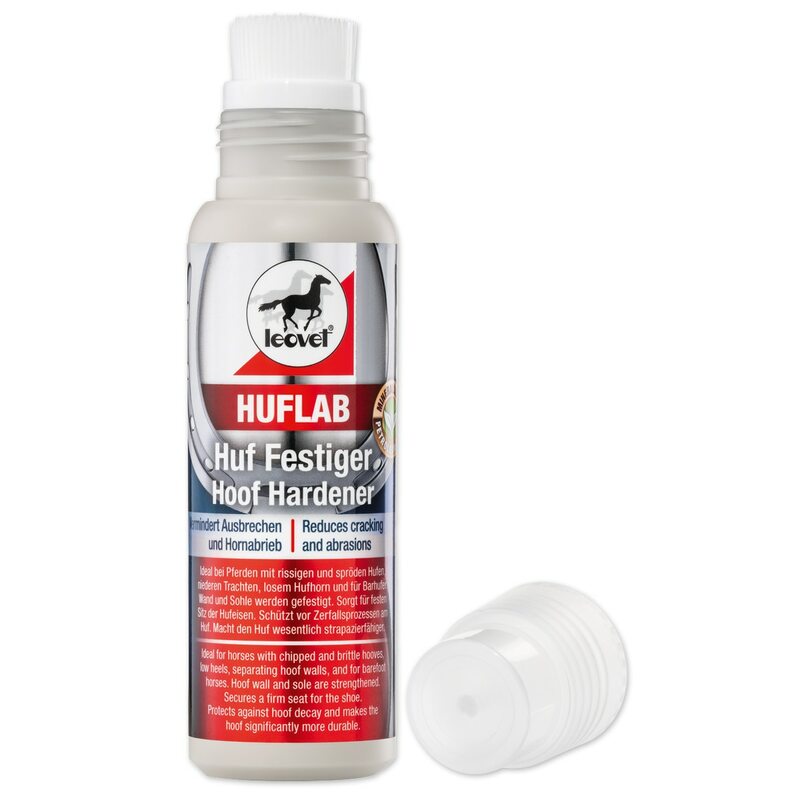 Leovet® Hoof Lab Hoof Hardener is rated 3.5 out of 5 by 2. Rated 3 out of 5 by Burnsies from Poor brush I used this for the first time yesterday. The applicator brush is a nice idea but this brush is horrible to apply the product with because where it attaches is too soft and constantly pops off when I applied it to each hoof. It was very messy to keep putting back on the bottle. I cant honestly say if the product worked because I am going to order another product that is more user friendly to apply. Rated 4 out of 5 by BenAZ from Good choice This hoof hardener can be easier applied than the bottles with separate brush. I like that the little plastic brush top can be taken off to be cleaned as I use the product for 2 horses. It did come off unintentionally a few times recently though so I might switch to using a separate brush. The texture does not ‘sink in’ immediately as some others do but it provides good results after just 3 weeks of use. Overall I feel that this is a product I will keep using.